The tri-state area is located in the heart of the Northeast megaregion, an agglomeration stretching from Portland, ME, to Richmond, VA, and encompassing parts of 13 states and the District of Columbia. The engines of the Northeast’s $3.8 trillion economy are its five big metro regions: Boston, New York, Philadelphia, Baltimore, and Washington, DC. The Northeast Corridor is one of the most productive areas of the country, accounting for 20 percent of GDP but only 2 percent of its land area. The region is one of 11 megaregions analyzed by the Regional Plan Association in its America 2050 initiative. Megaregions like the Northeast are characterized by interlocking economic systems, shared natural resources and ecosystems, and common transportation systems. Megaregions have captured most of the nation’s economic growth in the latter half of the last century and are expected to power growth in the 21st century. Economies of scale make these megaregions competitive with similarly-sized “global integration zones” of Europe and Southeast Asia, which have invested tens of billions of dollars in high-speed rail and goods-movement systems to support a highly mobile global workforce. The Northeast faces serious challenges despite its immense wealth, productivity, and concentration of highly skilled knowledge sectors. In many ways, these challenges reflect the problems of the New York metropolitan region: high housing costs, uneven economic growth, sharp disparities in incomes, congestion on its highways, unreliable railroads and overcrowded airports, and coastal regions that must adapt to climate change. Many of the issues surrounding infrastructure and natural systems addressed in the Fourth Regional Plan are also of concern to the entire Northeast, and therefore to the rest of the country. These include the Northeast Corridor train line, I-95 highway corridor, the Appalachian Highlands, and the Atlantic coastline along the Eastern Seaboard. Many critical components of these systems are located in the tri-state region: Penn Station, bridges and tunnels across the Hudson River, and the New York Harbor. When there are delays at New York’s airports, disruptions to its power grid, or changes in its greenhouse gas emissions, the impacts ripple across the Northeast and the nation. The Fourth Regional Plan advances many of the key strategies needed to maintain a strong megaregional network stretching from Washington to Boston, with New York City at its center. Implementing the Fourth Plan will address a number of the leading economic, transportation and environmental challenges of the megaregion, and provide a foundation for a larger megaregion strategy. 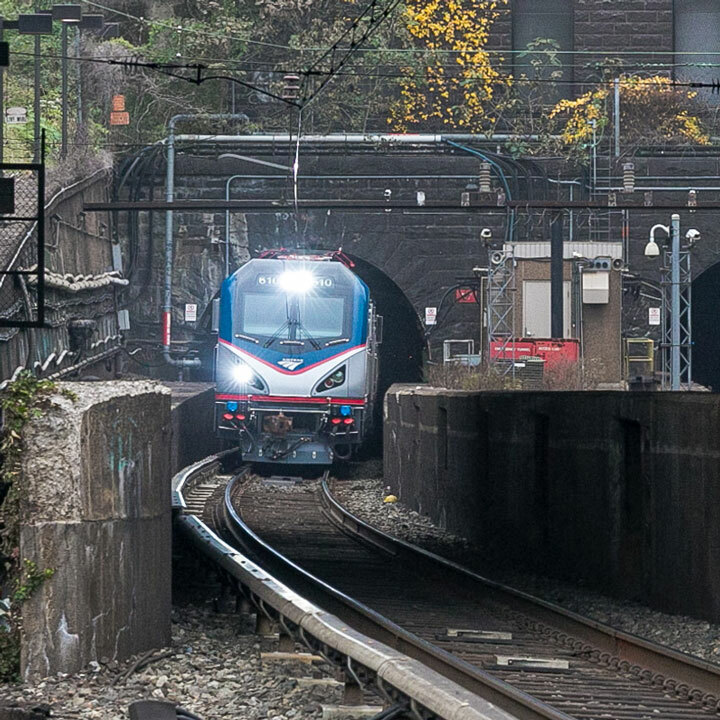 One priority is building new rail passenger tunnels under the Hudson River while allowing traffic to continue in the existing tunnels—a vital connection. Extending the Gateway project to Sunnyside Yards, and creating through-running services at an overhauled Penn Station complex, would significantly expand capacity throughout the entire Northeast Corridor. It would allow high-speed rail service that cuts the travel time between New York and Washington D.C. by 90 minutes, to 1.5 hours, and between New York and Boston by 60 minutes, to 2.5 hours. Expanding capacity at Kennedy and Newark airports would bolster the economy of the megaregion and help relieve delays at other airports throughout the Northeast and the rest of the country. Investments in the region’s seaports and rail freight systems would reduce truck traffic and the costs of moving goods throughout the megaregion. Reducing highway congestion with more extensive use of tolls would accelerate the movement of people and goods throughout the Northeast. Modernizing the electric grid in the tri-state region to handle increased demand and the need for a cleaner, more flexible system would improve reliability elsewhere in the Northeast, but require collaboration with providers and regulators in the megaregion. In a similar way, upgrading broadband infrastructure to provide high-speed internet in the metropolitan region would improve connections in other locations. The Fourth Plan recommendation that would require the most cooperation is the expansion of the Regional Greenhouse Gas Initiative (RGGI) carbon market to include all greenhouse gases from all sources. This would greatly reduce emissions throughout the Northeast while providing increased revenue to invest in an energy-efficient, equitable economy. The landscapes and water systems that would be protected and improved as part of the Fourth Regional Plan are integral to natural ecosystems and to the health and well-being of all Northeast residents. The national park proposed for the New Jersey Meadowlands would adapt a habitat that is critical to species along the East Coast and would be a model for other regions. The proposed Regional Coastal Commission could connect with similar commissions in bordering states, and the proposed regional trail network would connect to systems and landscapes well beyond the boundaries of the tri-state region.